If we felt sorry for Sarries losing three Red Roses to injury (Vicky Fleetwood, Bryony Cleall and Marlie Packer), we should note the eleven (11!) who strode out to put Wasps in their place. It took them nearly 20 minutes to get off the mark, but it was a six-hit out of the ground that did it. Zoe Harrison snaked through and delivered a remarkable offload to Jodie Rettie who found the field opening up in front of her. She galloped over. Luck was on the home team’s side. Sara Cox didn’t spot a high tackle by Lotte Clapp. The next moment there was a short forward pass (also unnoticed) which allowed Sarah McKenna to give Clapp a scoring pass. In the second half the other basis of Saracen strength came to bear. They drove and drove for Poppy Cleall to score by the left post. Then Hannah Botterman repeated the dose to put her side 24-6 ahead. Rosie Galligan became the third forward in a row to complete Sarries’ scoring. That in itself is proof of where the team’s ultimate strength lies. Wasps find life difficult against the best teams. 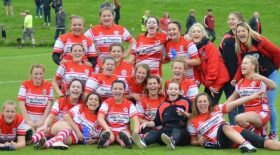 They did beat Sarries last year – by a single score – and they have plenty of talent spread through the side. But their backs rarely manage to move the ball dangerously past the opposition; too many lateral moves militate against penetration; too often they can be bundled into touch, as if they were playing on a narrow pitch. 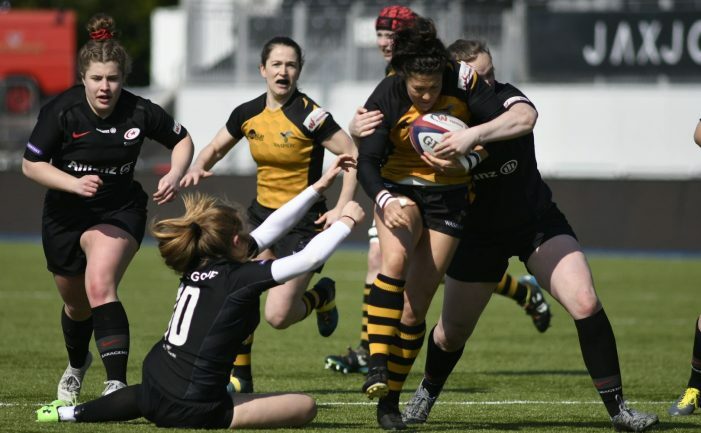 Their highest try-scorer remains Claudia Macdonald, the scrum-half; that tells its own story. Once more they asked Lizzie Goulden to kick penalty goals rather than take a chance on a move. She popped two over, but the score mounts very slowly that way. Not for the first time this season, they reserved their best move for the end of the game. A crisp ball into midfield saw a vibrant pod of three burst unstoppably over the line. Try to Louise Dodd. Why not earlier? By then the hosts had passed 30 points and were out of sight. 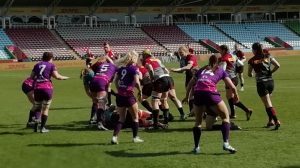 A dramatic start: Ellie Green kicked a penalty to the corner, Abbie Scott won the line-out, Quins drove and Katy Daley-Mclean saw a yellow card brandished for pulling down. All inside two minutes. We can debate the merits of that law till kingdom come; it remains a rich source of one-up-manship for the attacking team. Too rich? Lightning responded at once. Sarah Hunter offloaded to Sarah Bonar who strode through a long way. 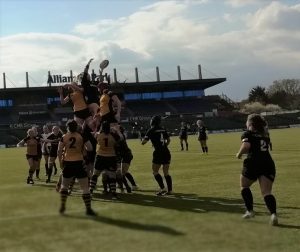 The ball came back fast, and there was Emily Scarratt aiming a long cut-out pass that gave Carys Williams the chance to show her winger’s credentials. Emily Scott’s covering tackle came just too late. A great team try in the left corner. If any home supporters doubted the quality of the invaders, they were disabused here. They may have forgotten that Lightning saw off the Quins 41-17 in Round 3. Strange to relate, Green didn’t find her kicking boots till later. Both her first two shots sliced right, then a tactical kick plopped straight into touch. But she had the mental resources to return to form. Quins didn’t find scoring easy; their opponents meant business. But when a forward drive came close to the line, Jade Konkel proved her unstoppable self with a second try. At the break the visitors must have thought they were in with a good chance of victory, only seven points down. 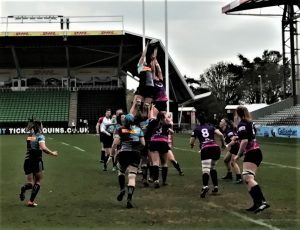 Their one handicap was the departure of Emily Scarratt; she suffered a suspected dislocated thumb after the first quarter of the game. She and Daley-Mclean shared duties in tactical kicking. Their input pushed Quins back over large tracts of land. Inexperienced players must find that one of the hardest burdens to bear. Scarratt’s injury at least allowed Carys Williams to resume her normal position of No 13, while another international, Charlotte Pearce, added pace to the left wing. Lightning restarted well, Rachel Malcolm making a great break down the left, but when Pearce threw an inside pass from the very edge, it didn’t go to hand. For all their aggressive intent they found the hosts at their most unyielding. Into the last quarter, and the quality of Quins’ forward play took the eye. They drove with constant changes in the point of attack for Vickii Cornborough to finish the job. A 19-5 lead gave the hosts breathing space. A late Quins drive took them to the 5-metre line once again. As the referee blew for a penalty, Leanne Riley was one step ahead. She tapped and was over before the defence could react. This fourth try ensured victory, but Lightning deserve credit for having the last word. The replacement scrum-half, Meg Davey, went over in the left corner. She was their third-choice No 9, as Ella Wyrwas was missing through injury. Her Scottish replacement, Jennie Maxwell, has an efficient pass, but it normally comes on the end of a three-step prelude, which meant that Daley-Mclean was too often deprived of vital thinking time. One curiosity about this high-class match: the three head coaches, Karen Findlay, Gary Street and Rhys Edwards have between them coached three national sides: Scotland, England and Wales. When did that last happen? Firstly, a show of hands, please: who’s in favour of a final knock-out sequence at the end of a 6-month league season? Ah, that’s 2 in favour, and 998 against. Never mind, they can be quite tense, even if the underdog fails to win every time. Of the two games the second was more rewarding. It remained competitive for longer and offered the crowd a wider range of skills from both sides. Quite astonishingly, no fewer than 31 England internationals were on view over the weekend. Add to them players from Canada, the USA, France, Spain, Sweden, Germany, Scotland, Ireland, New Zealand and Wales, and you get a sense of the quality on show. There were two convincing winners, the same two as last year. Quins came agonisingly close to beating Sarries in the final moments of that first Tyrrells final. Next time they must make sure they don’t let their opponents establish an unbridgeable lead. Northampton is likely to see the greatest club game yet put on show in England.